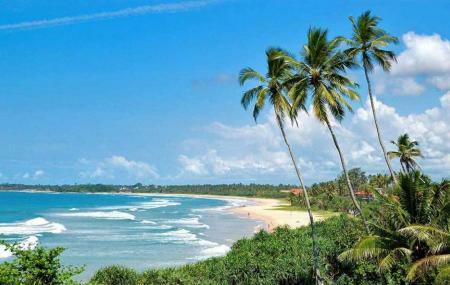 Having a lovely, picturesque shore, the Bentota beach stretches across for miles. Head over to have a leisurely walk along the beach or for a quick swim in the sea. However, visit early in the morning or in the evening, afternoon tends to be very hot and humid. Many of the hotels and accommodations are situated near the beach, so one can walk down to it to catch a beautiful sunset or a serene sunset. Activities such as snorkelling can be enjoyed in the sea waters. How popular is Bentota Beach? People normally club together Sunshine Centre and Galapatha Buddhist Temple while planning their visit to Bentota Beach. Yet another great beach towards the southern coastal area of the island. This long, broad sandy beach becomes very much live during October to April holidays. There are plenty of restaurants, guest houses and pretty much everything that a tourist needs in the vicinity. One of the amazing beaches. Crystal water, white smoothy sands. You can see the sunrise and sunset from the beach side. It’s safes beach you can swim anything early morning , morning, afternoon , evening or even midnight. People is very kind, helpful and easygoing . Entry to the beach is just beside the Taj resort entrance, you will have to cross the Taj property lawn. Beach is very clean with clear water and less crowd. I would recommend this beach for families. Enjoyed evening walk with very less people around which gave a private beach feel. Not sure if is always this peaceful. There are some big rocks with tress if you are looking some shade during afternoons. Great beach, for adults and children too.